K Group was founded in 1989 by an experienced group of professionals from New York and Washington DC. The company moved its headquarters to Phoenix Arizona in 1992 where it merged with the public relations firm, Shover Communications in 1994. Over the past 15 years K Group has provided marketing services to the hospitality industry, business-to-business sellers, magazine publishers, newspaper publishers and to charitable foundations and non-profit organizations. K Group’s approach to client problems employs state-of-the-art analytical tools combined with practical hands-on experience. This enables us to achieve uncommon results for our clients and regularly exceed their expectations. Since founding K Group in 1989, the average client relationship has exceeded seven years. • One charitable foundation client has used K Group services for eight years. • Four newspaper clients out-sourced their strategic marketing function to K Group for an average of just over six years. • One client retained K Group for four years to track customer satisfaction before internalizing the function. • Three pricing clients use K Group every two years to re-structure their pricing based on advertiser reaction to past pricing actions. K Group’s business is based on strong word of mouth and uncommon results to the most difficult business problems. Our consultants are sought after as expert witnesses in areas of litigation support for clients. They speak at national and regional conferences quarterly – sharing the expertise accumulated over the past 20 years of professional consulting and corporate work experience. K Group has a strong charitable giving belief. 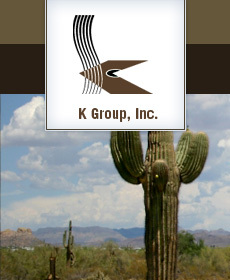 Annually, K Group donates 10% of corporate profits to deserving local and national charities. In addition, K Group’s officers serve on a number of charitable board of directors including Arizona Community Foundation, a fraternal educational foundation, AZ Humane Society (advisory committee), and Northern Arizona University Foundation (past board member). Have a question? A number of K Group clients take advantage of our telephone and internet consulting option. Travel is expensive. And while it certainly is important to establish face-to-face relationships, the expense and time involved in extensive travel stops projects before they get off the ground. To solve this problem and, in the process, cut from 25% to 50% of the cost of a project, K Group initiated the Tele-Consulting Option in 2002. The concept is simple - - frequent tele-conferences to discuss data collection, project design, update progress, present final reports, provide ongoing advice and counsel and be available for crisis counseling in just a moment’s notice. K Group can provide this option for any client whether it is a retainer, hourly, or project-based relationship. Have a question?